This is the map of European countries encouraging employee share ownership. 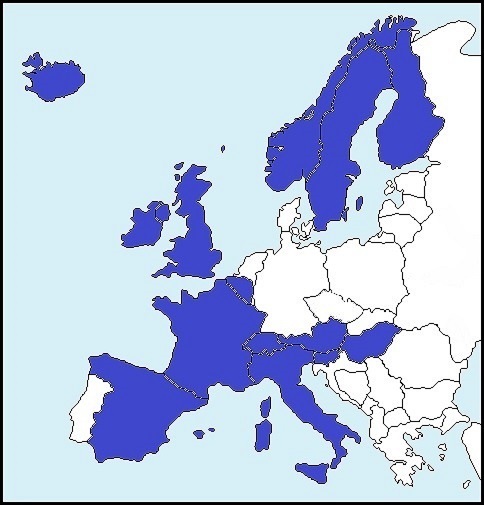 In blue, the 12 European countries supporting employee share ownership through significant fiscal incentives. This is a minority of Member States in the European Union. However, this minority of 12 Member States of the EU represents the lion's share when considering European listed companies, stock market capitalization and employee share ownership: 72% of all European listed companies, with 72% of employees, 77% of the stock market capitalization, 83% of employee shareholders. See details in our new publication about "Employee Share Ownership for Building the Capital Markets Union". The European Commission launched a Green Book and a public consultation on "building a Capital Markets Union".  Better Finance, the European Federation of Investors and Financial Services Users. We have a selection of 24 remarkable articles in 5 countries in April 2015: France, Netherlands, Poland, UK, USA. France: Dispute about employee share ownership for Charlie Hebdo. "Macron Law" will reintroduce fiscal incentives for some employee share schemes. Employee ownership buy-out for La Redoute. Possible impacts of double voting rights on employee share ownership in France. Netherlands: Why fiscal incentives for employee share ownership don't exist in The Netherlands. Poland: Employee share ownership for Szczecin Harbour workers. UK: Tullis Russel collapse; the company was Scotland's largest employee-owned business. USA: New ESOP bill introduced in the US House of Representatives to encourage the creation of ESOPs. A set of new ESOP companies in April. What is an ESOP and how does it work.